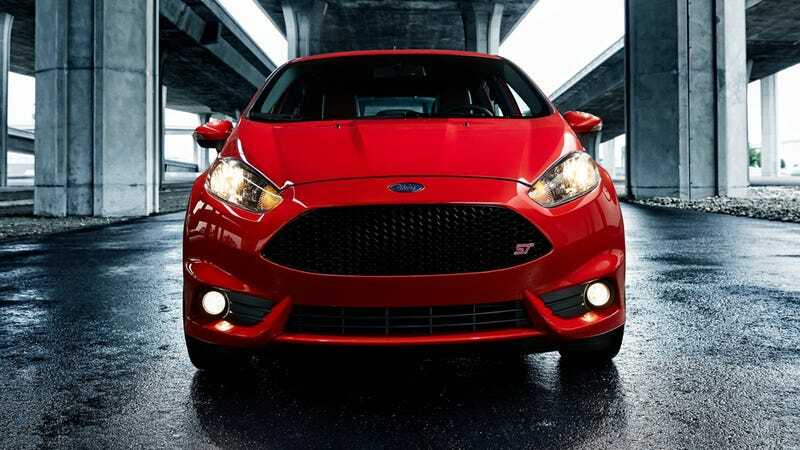 Pricing for the 2014 Ford Fiesta just went live. Yes, that includes the Fiesta ST. The Fiat 500 Abarth has some competition. With no options, the Fiesta ST will cost just $21,400. That's $600 less than an Abarth and undercuts a Mini Cooper S by about $2,500. Suhweeeet. And for that price, you're getting one of the most attractive hatchbacks on the market. And it has 37 more horsepower than the Abarth, to bring the total to a nice 197. It's not 200, but we'll take it. Dynamically, this looks like it'll be a pretty sweet little ride. I just spec'ed one out as I'd like it, and with Recaro seats and a couple other little doo dads, the little ST came to $24,985. That's definite Abarth territory. If you don't want a hot rod, the regular sedan starts at $14,000 and the hatchback at $14,600. Not bad at all.